“Our decision to establish a Shared Service Centre in Brno was made back in 2008 at the beginning of the financial and economic crisis. The private equity fund that owned Edwards Group at the time was seeking ways to streamline supporting processes and therefore decided to centralize finance and customer care activities in one location. Brno was selected as the logical choice partially because Edwards already had a service hub operation in Brno and a manufacturing site in the nearby city of Lutín. The strategic location, combined with a university city and a young educated made Brno a very attractive option. The transition mainly took place between 2009 and 2011, moving finance processes and Customer Care operations. “Ricardo is very pleased with the investment that we have made in the Czech Republic. The quality of the education system and the talent that we are able to attract in the Czech Republic has contributed significantly to the overall success of Ricardo. The continued growth of our operations in the Czech Republic remains a key part of our global strategy. Our successful experience has resulted in a commitment to further growth and investment in the Czech Republic. The combination of high-quality engineering graduates, a flexible workforce, and a convenient location means that Prague is set to be our largest Technical Centre outside of the UK. ”John Crane in Lutín, near Olomouc, has been building its reputation over the last 25 years and has become the biggest John Crane site in the world with currently over 520 employees. Along with our manufacturing capacity we also operate business services that demonstrate the world class capability of our teams. The company was initially established in 1992 as a joint venture with Sigma Pumps. The choice of Lutín in the heart of Moravia has proven to be successful thanks to its geographical location, sufficient pool of skilled and talented people and being a good entry point for further expansion to Eastern Europe. Expansion to the emerging markets in Central and Eastern Europe has been managed from the Czech Republic. The success of John Crane in Lutín then further inspired our sister division, Smiths Medical, to set-up a manufacturing plant in Hranice, in the Olomouc region. 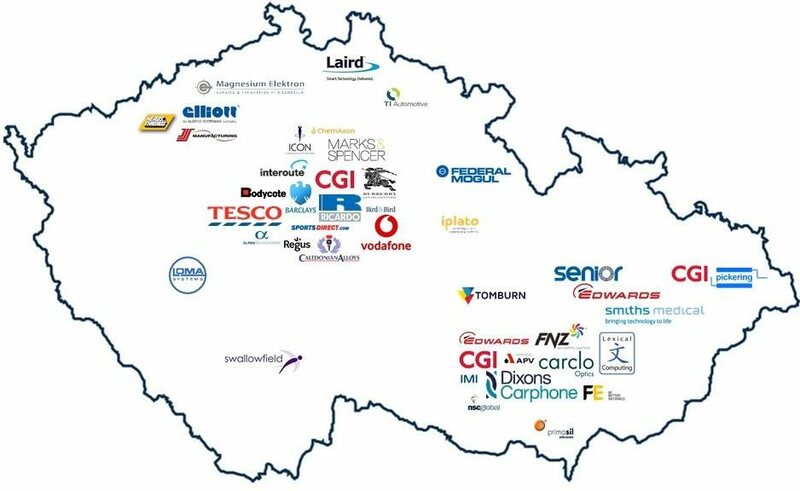 The Shared Service Centre in Lutín provides various services to other subsidiaries of the John Crane division as well as other divisions of Smiths Group plc – the global technology group. “Our investments in the Czech Republic over the past 10 years have proven successful, not least because of the skilled and highly educated workforce, and we are looking to further extend and develop our presence in the country. Barclays, Bodycote, CGI, Federal Mogul, Financial Express, FNZ, Interoute, Laird Technologies, Swallowfield, TI Automotive.